Photo: Protestors are reflected in a puddle as they wave European flags to demonstrate against Brexit in front of the Parliament in London, Monday, Dec. 3, 2018. 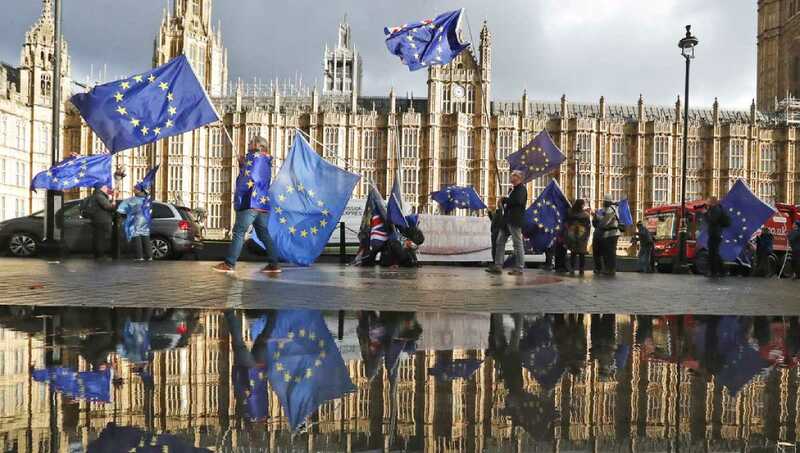 London, Dec 4 : A top official at the European Union’s highest court advised Tuesday that Britain can unilaterally change its mind about leaving the European Union, boosting hopes among to pro-EU campaigners in the U.K. that Brexit can be stopped. Prime Minister Theresa May’s government insists it will never reverse the decision to leave, but May faces a tough battle to win backing in Parliament before lawmakers vote next week on whether to accept or reject the divorce agreement negotiated with the bloc. Defeat would leave the U.K. facing a chaotic “no-deal” Brexit and could topple the prime minister, her government, or both. Advocate General Manuel Campos Sanchez-Bordona told the European Court of Justice that a decision by the British government to change its mind about invoking the countdown to departure would be legally valid. The advice of the advocate general is often, but not always, followed by the full court. The court is assessing the issue under an accelerated procedure, since Britain is due to leave the bloc on March 29. The final verdict is expected within weeks. Britain voted in 2016 to leave the 28-nation bloc, and invoked Article 50 of the EU’s Lisbon Treaty in March 2017, triggering a two-year exit process. Article 50 is scant on details — largely because the idea of any country leaving the bloc was considered unlikely — so a group of Scottish legislators asked the courts to rule on whether the U.K. can pull out of the withdrawal procedure on its own. The EU’s governing Commission and Council oppose unilateral revocation, arguing it requires unanimous agreement of the 27 remaining members of the bloc. The advice bolstered anti-Brexit campaigners, who hope the decision to leave can be reversed. “That puts the decision about our future back into the hands of our own elected representatives — where it belongs,” said Jo Maugham, a British lawyer who helped bring the case. May has repeatedly said the government will not seek to delay or reverse Brexit. But the court’s opinion is another headache for the Conservative prime minister as she battles to win Parliament’s backing for the divorce deal she has agreed with the EU. But her chances of winning majority backing for the deal when Parliament votes on Dec. 11 look slim. Politicians on both sides of Britain’s EU membership debate oppose the agreement that May struck with the bloc — pro-Brexit ones because it keeps Britain bound closely to the EU, and pro-EU politicians because it erects barriers between the U.K. and its biggest trading partner. Leaving the EU without a deal would end more than 40 years of free trade and disrupt the flow of goods and services between Britain and the EU. The Bank of England warned last week that a no-deal Brexit could plunge Britain into a severe recession, with the economy shrinking by 8 percent in the months after March 29. Before the debate, May’s government faced another showdown with lawmakers over the legal advice about the Brexit deal. Lawmakers were set to vote on a motion finding the government in contempt of Parliament for refusing to publish the full guidance from Attorney General Geoffrey Cox. Cox could be suspended from Parliament if he is found in contempt.